Defending champions Western Suburbs made Endeavour Park a fortress in 2017, dropping just two points at home all season. They start their title defence there against Lower Hutt City, but they will be without Auckland City players Callum McCowatt, Dalton Wilkins, and Owen Parker-Price (Harry Edge has been included in their preliminary squad) for the start of the season while they play in the Oceania Champions League. Their notable gains include former Team Wellington defender Erik Panzer and Mohammed Awad, who is back from the United States. Lower Hutt pushed Wests all the way in the corresponding fixture last season, going down 2-1 after a dogged defensive display. They have maintained a reasonably settled squad and will be a staunch defensive opposition. Wellington United celebrate its 125th anniversary year with a traditional clash against Miramar Rangers. Miramar have a former Phoenix academy player in their midst, with Ruairi Cahill-Fleury joining from Island Bay United. Wellington finished third last year, while Miramar were fifth. Stop Out enjoyed a very good campaign in 2017, leading the league for a time in the middle stages before fading to finish fourth. They have a largely settled team, but have lured Lewis Jackson out to Hutt Park from Miramar. They host competition newcomer Havelock North Wanderers, who lost last year’s Central League playoff to Waterside Karori, but have joined the competition after Team Taranaki withdrew. They have an almost identical, locally-based squad to last year. Their Hawke’s Bay rivals, Napier City Rovers, have taken a slightly different approach, recruiting from outside the region to bolster a squad which has just seven players returning from last season. They welcome the other competition newcomer, Karori, to Park Island, with the visitors also experiencing much change in the offseason. Rupert Crump has replaced Martin Pereyra-Garcia as coach, while midfielder Leo Villa has left for Olympic. Team Wellington’s South Korean import, Kyung Dong Kim, has arrived despite not playing a game for the national league team. American YouTube star Matt Sheldon has signed from the United Soccer League, while fullback Dan Restorick has come from non-league football in England. The late match of the round takes place at Wakefield Park as last year’s runner-up Wairarapa United take on 2016 champions Wellington Olympic. Wairarapa again boast national league talent in Tasman players Paul Ifill, Cameron Lindsay, Daniel Allan, and Callan Elliot, although the former will be busy coaching the club’s women’s team. Olympic have signed Hawke’s Bay United’s Gavin Hoy in addition to Villa as they try to bounce back from a tumultuous 2017 season which saw them finish seventh. 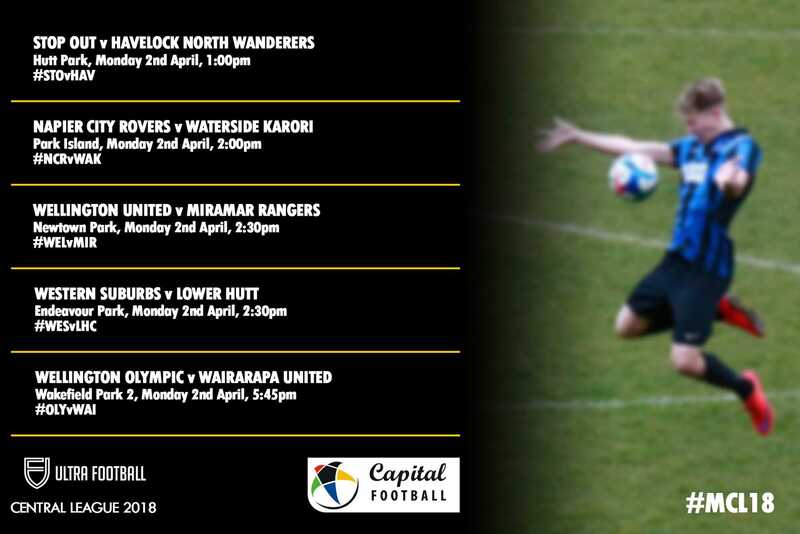 The Capital Premier division also kicks off on Easter Monday. With four reserve teams in the grade, it is left to the remaining six teams to battle it out for the lone spot in the Central League playoff. Petone are perennial favourites in this grade. They finished second last year, five points behind Karori, but seven points clear of the nearest first-team in North Wellington. They travel to Wakefield Park to play Island Bay United, who finished fifth last year, in their first-round fixture. North Wellington get their campaign underway against the newly-promoted Miramar Rangers reserves. It’s a good time to be playing that team given their first-team will need reinforcements while Team Wellington compete in the Oceania Champions League. Fellow promoted team Kapiti Coast United start at home against Lower Hutt City’s reserve team, while Tawa, who finished sixth last year, are away to Western Suburbs’ reserves in a curtain-raiser to the Central League game at Endeavour Park. Upper Hutt City also serve as an appetiser to Central League action when they play Olympic’s reserves at Wakefield Park.